As of July 1st 2015, Oahu has experienced a new transition to join its fellow neighbor islands in their efforts to support the plastic bag ban. HiTel FCU and other local credit unions around the state have partnered with Hawaii Credit Union League to allow consumers to provide assistance to local children and reduce their carbon footprint at the same time. “Mauka to Makai – Save the ‘Aina for the Children,” which represents its “go green” efforts. Therefore, the bag depicts vivid images on both sides of the bag representing Mauka (Mountains) on one side and Makai (Ocean) on the other with our very own HiTel side panel with our friendly mascots – Yoko the ladybug and Kalea the turtle. 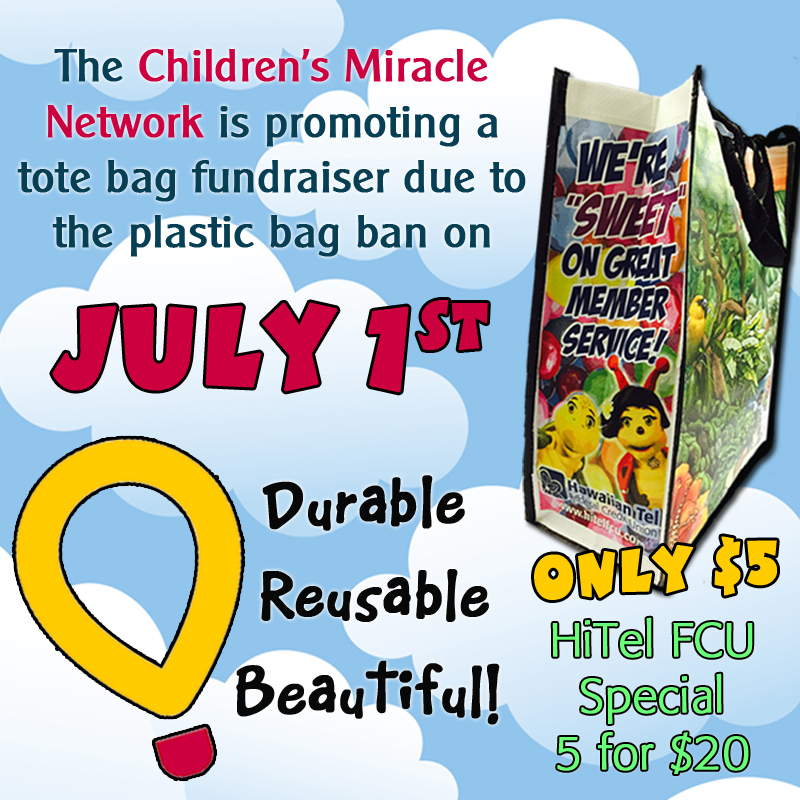 This entry was posted in Kalakoa Musings and tagged bag ban, benefit, Bishop Street, children, Children's Miracle Network, credit union, Downtown, ewa beach, family, finance, Fort Street, friends, fundraise, Halekulani, hawaii, hawaiian tel fcu, hitelfcu, honolulu, hospital, Kaimuki, Kalihi, Kapalama, Kapiolani Children's Medical Center, kapolei, kunia, mccully, mililani, no plastic, resuable bag, Schofield, Sheraton, support, tote, Wahiawa, Waikiki, waipahu, Wheeler AAF by Hawaiian Financial Federal Credit Union. Bookmark the permalink.